September 16, 2016, 7:56 p.m.
With the average life expectancy increasing every year, you might expect that British people would have had the opportunity to tap into the wealth of family knowledge their older relatives have. Yet new YouGov research finds that British people don’t even know much about their grandparents, let alone earlier generations of their family. Just one in three (35%) say that they know a lot about their grandparents, compared to 56% who know a little about them and 8% who know nothing at all. ​The level of knowledge we have of our families falls off a cliff edge as soon as we get past our grandparents. 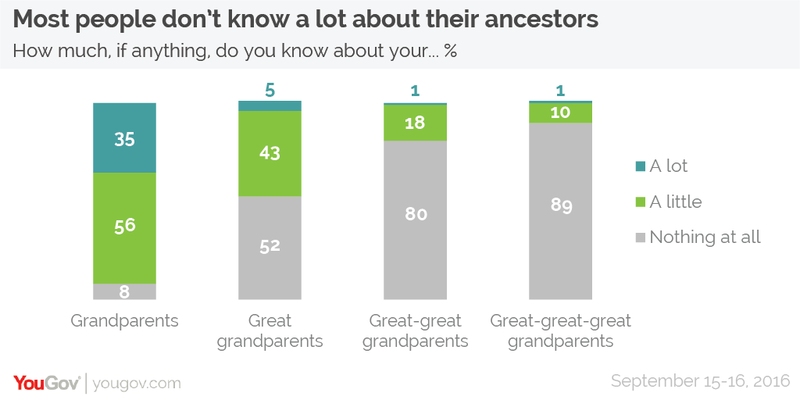 Just 5% of people say they know a lot about their great grandparents, whilst the majority (52%) know nothing at all. Despite the lack of knowledge, British people are clearly not that interested in finding out more. Just under three in ten (28%) people have done some research into their family tree, whilst 72% have not. Older people are more likely to have looked into their family’s past – 36% for those aged between 50 and 64 and 40% for those 65 year olds and over. People are split on whether their family’s lot in life has improved over the past 100 years. Four in ten people believe that their family has moved up in the world, whilst another four in ten do not (although only 5% of these actively think their family has moved down in the world). 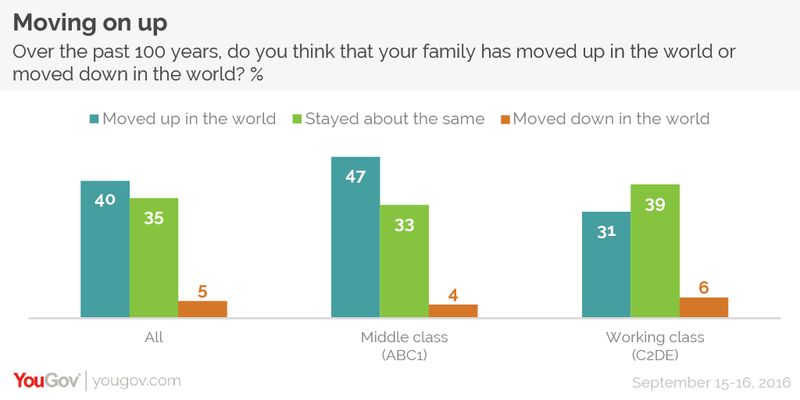 Perhaps unsurprisingly, middle class people are more likely to think their family has moved up in the world (47%), whilst working class people are more likely to think they’ve stayed the same (39%).